Bit-tech: When you knew you were going to make a very small PC, what did you consider to be your main obstacles, and what steps did you take to overcome them? 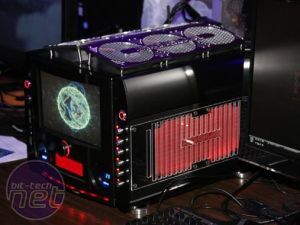 Mike Krysztofiak: I always wanted to push them boundaries and build something extraordinary, something that was never built before - that is why I wanted to build smallest possible case, only big enough to fit in all the hardware I wanted. Biggest obstacles for builds like that would be the heat issues and dimensions of each element. This is why the most important part of the project is first stage - planning. I had to plan everything from the beginning to the end, measure every single piece of equipment I wanted to use to make sure I have space for all of them and there won't be any "collisions". Not having all the parts, I had to find their dimensions on internet and then design it all in Google Sketchup to properly "see" it. After all this preparation I was sure I can start building it. Craig Brugger: I’ve been a fan of small PCs for almost as long as I can remember, but it wasn’t until I bought my first Shuttle SN25P barebone system years ago that I was well and truly hooked. There was something about having so much power in such a case that really intrigued me. I enjoyed being able to just pick up the case and head to the nearest LAN without lugging a full size tower around. I didn’t feel I was compromising anything at first, but soon after, the modder in me was convinced a few changes were in order. It wasn’t long, and I had cleanly integrated a LCD into the front of the case, and then subsequently upgraded to the SN26P which was capable of SLI. After stuffing an AMD FX-60 and pair of Nvidia 7800 GTX’s in to the case, I came face to face with my first SFF limitation... heat! Solutions for the heat problem were pretty slim at the time, and Shuttle PC’s of that era had no real upgrade path, so I moved on to the next project. Having experienced it with the Shuttle, I knew heat was going to be the most formidable opponent in any future project. No matter how much hardware I wanted to put in to a case, if it couldn’t be kept cool, it would render high dollar hardware useless. I upgraded to a SilverStone SG01, and project L.O.S.I.A.S. was born. I addressed my previous heat issue by modifying a Coolit Freezone TEC cooler, and adding extra fans. While the case could now be kept cool, I had to remove the OEM hard drive bays to accommodate that extra cooling. That presented my second SFF limitation... space! I had to start thinking of component placement in a very creative manner. It’s a little like playing with Lego when you were a youngster. Making the pieces fit together was only part of the answer. Poor placement would undo any gains I had made in cooling, so careful consideration had to be made at every step of the way. I realized that through creative space management, I could not only relocate my hard drives, but add dual slot load DVD drives, a 7” touchscreen, and an integrated fan controller. Once again, with the discontinuation of the only SLI micro-ATX motherboard and no alternatives on the horizon, a new SFF mod was in order. 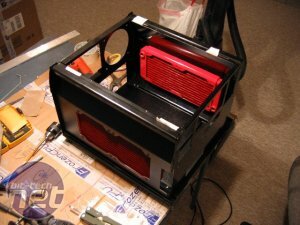 With Project Rogue I intended to directly address the heat and space issues of my two previous SFF attempts, while pushing the limits of what most even considered a SFF mod. While the NZXT Rogue was pretty large for a mATX case, I intended to use every cubic cm available. The case was modified to fit an ATX board, and that was only the beginning. Having such great luck with the TEC cooler on L.O.S.I.A.S., I decided to use one again. A Wintsch Labs Arctic Web was chosen, and that brought it’s own set of issues. It required a dedicated 24v power supply. At that point I was planning on dual PSU’s, SLI, dual radiators and associated tubing and pump, 4 hard drives, 10” LCD, integrated fan controller, dual slot load DVD drives, dual digital automotive temperature gauges, and an entirely separate system powered by a VIA picoITX motherboard. All of this brought me to my third SFF limitation... wiring! Finding room for components was one thing, finding somewhere for all the associate cables was an entirely different matter. Not only was clean cabling necessary from a aesthetic standpoint, but it could have a direct impact on performance. Cluttered cables impede airflow, make troubleshooting difficult, and slow down maintenance. To address this, custom length sleeved cables, and channeled routing were employed. The end result was a system that performed well, and looked pretty good doing it, despite being packed with hardware to an almost ludicrous level. troubleshooting and replacing a component because the case is hard to work on. A little planning goes a long way. Bit-tech:As you started building the project, did any other issues arise? Craig Brugger: I came across plenty of issues. Some minor, some major. The important thing is to keep your plan somewhat flexible, and be willing to adapt your goals if needed. None of my projects ended up how I had originally envisioned them. The challenges I faced along the way forced me to rethink my processes, and some great improvements came about because of them.